The Huffington Post rips on single-use sacks and sings the praises of reusable bags. Paper or plastic bags: which is better? 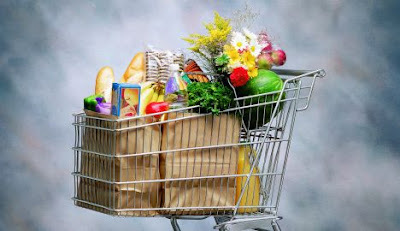 It’s an age old question, when it comes time to check out when grocery shopping: paper bag or plastic bag? It seems like it should be an easy choice, but there’s an incredible number of details and inputs hidden in each bag. From durability and reusability to life cycle costs, there’s a lot more to each bag than meet the eye. Let’s take a look behind the bags. Where do brown paper bags come from? Paper comes from trees — lots and lots of trees. 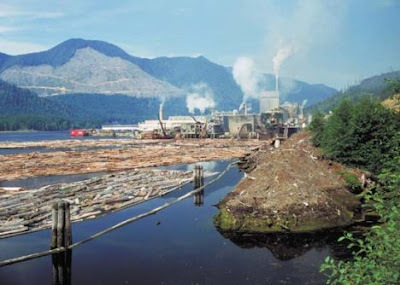 The logging industry, influenced by companies like Weyerhaeuser and Kimberly-Clark, is huge, and the process to get that paper bag to the grocery store is long, sordid and exacts a heavy toll on the planet. First, the trees are found, marked and felled in a process that all too often involves clear-cutting, resulting in massive habitat destruction and long-term ecological damage. Mega-machinery comes in to remove the logs from what used to be forest, either by logging trucks or even helicopters in more remote areas. This machinery requires fossil fuel to operate and roads to drive on, and, when done unsustainably, logging even a small area has a large impact on the entire ecological chain in surrounding areas. Once the trees are collected, they must dry at least three years before they can be used. More machinery is used to strip the bark, which is then chipped into one-inch squares and cooked under tremendous heat and pressure. This wood stew is then “digested,” with a chemical mixture of limestone and acid, and after several hours of cooking, what was once wood becomes pulp. It takes approximately three tons of wood chips to make one ton of pulp. The pulp is then washed and bleached; both stages require thousands of gallons of clean water. Coloring is added to more water, and is then combined in a ratio of 1 part pulp to 400 parts water, to make paper. The pulp/water mixture is dumped into a web of bronze wires, and the water showers through, leaving the pulp, which, in turn, is rolled into paper. Whew! And that’s just to make the paper; don’t forget about the energy inputs — chemical, electrical, and fossil fuel-based — used to transport the raw material, turn the paper into a bag and then transport the finished paper bag all over the world. 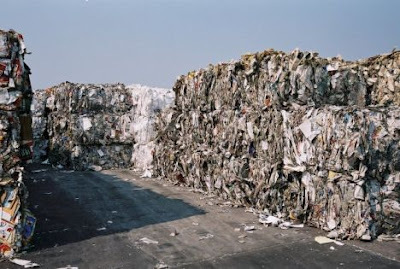 Paper recycling plants, like the one shown above, is the best place for bags to go when you’re done with them. Where do paper shopping bags go when you’re done with them? When you’re done using paper shopping bags, for shopping or other household reuses, a couple of things can happen. If minimally-inked (or printed with soy or other veggie-based inks) they can be composted; otherwise, they can be recycled in most mixed-paper recycling schemes, or they can be thrown away (which is not something we recommend). If you compost them, the bags break down and go from paper to a rich soil nutrient over a period of a couple of months; if you throw them away, they’ll eventually break down of the period of many, many years (and without the handy benefits that compost can provide). If you choose the recycle paper bags, then things get a little tricky. The paper must first be re-pulped, which usually requires a chemical process involving compounds like hydrogen peroxide, sodium silicate and sodium hydroxide, which bleach and separate the pulp fibers. The fibers are then cleaned and screened to be sure they’re free of anything that would contaminate the paper-making process, and are then washed to remove any leftover ink before being pressed and rolled into paper, as before. How are plastic bags produced? 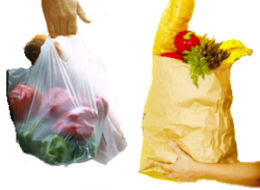 Unlike paper bags, plastic bags are typically made from oil, a non-renewable resource. Plastics are a by-product of the oil-refining process, accounting for about four percent of oil production around the globe. The biggest energy input is from the plastic bag creation process is electricity, which, in this country, comes from coal-burning power plants at least half of the time; the process requires enough juice to heat the oil up to 750 degrees Fahrenheit, where it can be separated into its various components and molded into polymers. Plastic bags most often come from one of the five types of polymers — polyethylene — in its low-density form (LDPE), which is also known as #4 plastic. How does plastic bag recycling work? Like paper, plastic can be recycled, but it isn’t simple or easy. 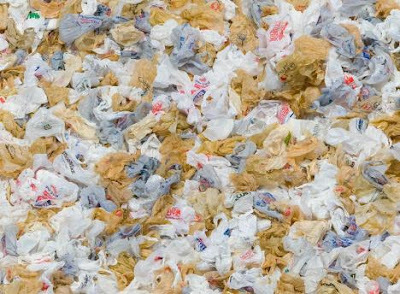 Recycling involves essentially re-melting the bags and re-casting the plastic, though, according to the U.S. EPA, manufacturing new plastic from recycled plastic requires two-thirds of the energy used in virgin plastic manufacturing. But, as any chef who has ever tried to re-heat a Hollondaise sauce will tell you, the quality isn’t quite as good the second time around; the polymer chains often separate, leading to a lower-quality product. What does that mean to you? Basically, plastic is often downcycled — that is, the material loses viability and/or value in the process of recycling — into less functional forms, making it hard to make new plastic bags out of old plastic bags. 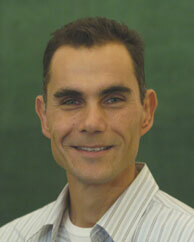 What about biodegradable plastic bags? Biodegradable plastic is a mixed bag (pun intended) as well; while biopolymers like polyhydroxyalkanoate (PHA) and Polylactide (PLA) are completely biodegradable in compost (and very, very, very slowly — if at all — in a landfill) and are not made from petroleum products, they are often derived from our food sources. The primary feedstock for bioplastics today is corn, which is rife with agro-political conflict and often grown and harvested unsustainably; because of these reasons, and because it competes with food supply, it is not likely to be a long-term solution in the plastics world. Plus, some bags marked “biodegradable” are not actually so — they’re recycled plastic mixed with cornstarch. The cornstarch biodegrades and the plastic breaks down into tiny little pieces but does not actually “biodegrade,” leaving a yucky polymer mess (if in small pieces). The only way to avoid this? Look for 100% plant-based polymers, like the two mentioned above. So, while it’s good to have the alternative (and to recognize the innovation it represents), bioplastics aren’t quite ready to save us from the paper or plastic debate. Further insight into the implications of using and recycling each kind of bag can be gained from looking at overall energy, emissions, and other life cycle-related costs of production and recycling. According to a life cycle analysis by Franklin Associates, Ltd, [pdf] plastic bags create fewer airborne emissions and require less energy during the life cycle of both types of bags per 10,000 equivalent uses — plastic creates 9.1 cubic pounds of solid waste vs. 45.8 cubic pounds for paper; plastic creates 17.9 pounds of atmospheric emissions vs. 64.2 pounds for paper; plastic creates 1.8 pounds of waterborne waste vs. 31.2 pounds for paper. Paper bags can hold more stuff per bag — anywhere from 50 percent to 400 percent more, depending on how they’re packed, since they hold more volume and are sturdier. The numbers here assume that each paper bag holds 50 percent more than each plastic bag, meaning that it takes one and half plastic bags to equal a paper bag — it’s not a one-to-one comparison, even though plastic still comes out ahead. It’s important to note that all of the above numbers assume that none of the bags are recycled, which adds a lot of negative impacts for both the paper and plastic bags; the numbers decrease in size (and the relative impacts decrease) as more bags are recycled. Interestingly, the numbers for paper bag recycling get better faster — the more that are recycled, the lower their overall environmental impact — but, because plastic bags use much less to begin with, they still ends up creating less solid and waterborne waste and airborne emissions. From the same analysis, we learn that plastic also has lower energy requirements — these numbers are expressed in millions of British thermal units (Btus) per 10,000 bags, again at 1.5 plastic bags for every one paper bag. Plastic bags require 9.7 million Btus, vs. 16.3 for paper bags at zero percent recycling; even at 100% recycling rates, plastic bags still require less — 7.0 to paper’s 9.1. What does that mean to me and you? Plastic bags just take less energy to create, which is significant because so much of our energy comes from dirty sources like coal and petroleum. The best way to go? A reusable bag, not a plastic bag. 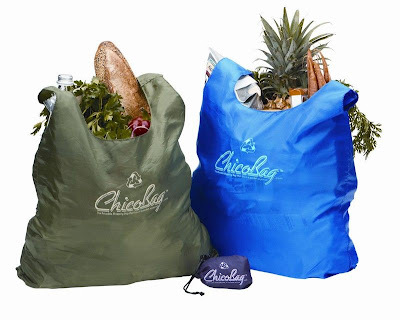 [Andy Keller’s wildly popular ChicoBag gives reusable bags convenience. Both paper and plastic bags require lots and lots of resources and energy, and proper recycling requires due diligence from both consumer and municipal waste collector or private recycling company, so there are a lot of variables that can lead to low recycling rates. Ultimately, neither paper nor plastic bags are the best choice; we think choosing reusable canvas bags instead is the way to go. From an energy standpoint, according to this Australian study, canvas bags are 14 times better than plastic bags and 39 times better than paper bags, assuming that canvas bags get a good workout and are used 500 times during their life cycle. Happy shopping!